More than 400 social organizations from Europe and Latin America and the Caribbean will gather on Jan. 25-27 at a Summit of the Peoples called as an alternative to the bi-regional meeting of heads of state and government to be held at the same time in the Chilean capital. (IPS) – More than 400 social organisations from Europe and Latin America and the Caribbean will gather on Jan. 25-27 at a Summit of the Peoples called as an alternative to the bi-regional meeting of heads of state and government to be held at the same time in the Chilean capital. Convened under the slogan “For social justice, international solidarity and sovereignty of the peoples”, the aim of the meeting held parallel to the Santiago summit of EU and Latin American and Caribbean leaders is to make sure the civil societies of both regions are heard, as they voice their opposition to the model of development imposed by previous bi-continental summits. 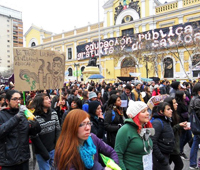 “The peoples are being forced to bear the brunt of a crisis that was unquestionably caused by poor financial management,” Chilean activist Martín Pascual, one of the organisers of the alternative summit, told IPS. “This summit is a response to that official view that comes from the so-called First World, and we believe that we’re going to find echo in several Latin American governments that hold a different view, and, of course, among social organisations,” he said. Pascual noted that there are a number of countries in Latin America and the Caribbean that promote a “more independent, more autonomous, more sovereign” path. “The governments of Venezuela, Argentina, Brazil, Ecuador and several other countries have refused to bow to the demands of the International Monetary Fund (IMF) and other international financial institutions. Many of these countries have clashed with multinational corporations over nationalisations,” he said. In Pascual’s opinion, the slogan chosen for the official summit, “Alliance for Sustainable Development to Promote Investments of Social and Environmental Quality”, sparks a warning among many peoples and social organisations because “it prioritises the issue of investments, even if these are qualified” by social and environmental considerations. This will be the seventh biennial EU-LAC summit since top leaders of the two regions started meeting in Rio de Janeiro in 1999. But this year’s edition in Santiago marks a new start, as it will be the first time that the Latin American and Caribbean region participates through the Community of Latin American and Caribbean States (CELAC), its recently created intergovernmental body for political integration. The new regional body, founded in 2010, will celebrate its first summit with the EU in Santiago on Jan. 26-27. Hosts expect that of the 33 CELAC member countries 24 presidents will attend the summit, along with 17 heads of state of a total of 27 EU nations, in addition to EU authorities. As current temporary president of CELAC, Chile will also host the regional body’s first formal summit on Jan. 27-28, where Cuba will assume the presidency. So far CELAC has only had two major meetings: one in Mexico in 2010, in which the body was created, and another in Venezuela in 2011, where it began operating. According to figures from the board of global economic relations of Chile’s Foreign Affairs Ministry, CELAC-EU trade expanded at an average annual rate of 13 percent from 2002 to 2011, totalling 276 billion dollars in 2011, up 23.9 percent from 2010. The summit, however, will take place against the backdrop of the European bloc’s economic and financial crisis, which it is combating with rigid austerity policies imposed by Brussels on the worst-hit governments. This strategy is viewed by civil society in both regions as a serious setback for social justice and democracy. “Europe is suffering a crisis that affects the most developed countries, in a context in which Latin America also faces certain difficulties, in particular with the presence of multinational corporations,” Pascual, who is also head of the Chilean Association of Non-Governmental Organisations, told IPS. To make things worse, he said, there are additional “pressures from some international funding agencies”. For Pascual, the 2013 Peoples Summit takes on greater importance in view of the historical moment that global civil society is living. “If there’s a common denominator that characterises both continents today it is the mass mobilisation of their civil societies,” he said. That year, activists and social organisations from around the world gathered in the U.S. city of Seattle to counter the World Trade Organisation (WTO) meeting held there. The Peoples Summit will begin this Friday, Jan. 25 with a march through the streets of Santiago, culminating in a cultural and artistic celebration in the Plaza de Armas, the city’s main public square. From Friday until noon on Saturday, civil society organisations will hold 85 activities, followed by plenary meetings addressing the four key themes established for this summit: democracy, participation and sovereignty of the people against corporate power; labour and human rights against the privatisation of common goods; good living and rights of Mother Earth against the commodification of nature and life; and integration and solidarity of the peoples against social injustice. The Peoples Summit 2013 will also focus on investments, gender and indigenous peoples as crosscutting issues. For anthropologist Juan Carlos Skewes, these meetings held in parallel to governmental gatherings are a valuable contribution to the official meetings because they offer alternative visions. “In general, these high-level political summits represent the interests of each country’s elites and their discussions focus on financial (issues), taxes, foreign commerce and other such issues,” he explained. “It’s also an opportunity for civil society to meet, discuss and generate other views alternative to the prevailing regional, national and international processes,” he said.